- London Ice Dawgs is committed to protecting your privacy and developing technology that gives you the most powerful and safe online experience. This Statement of Privacy applies to the London Ice Dawgs Web site and governs data collection and usage. By using the London Ice Dawgs website, you consent to the data practices described in this statement. - The London Ice Dawgs Web Site is offered to you conditioned on your acceptance without modification of the terms, conditions, and notices contained herein. Your use of the London Ice Dawgs Web Site constitutes your agreement to all such terms, conditions, and notices. - All London Ice Dawg players, coaches and volunteers are covered under our Commercial Property and Liability Insurance policy held with Omni Insurance and Sports-Can Insurance Consultants Ltd, for all ice times, tournaments and special events as scheduled by our league. All coaches and on ice helpers must wear a CSA approved hockey helmet (cage not required) and skates to enter the ice surface. Jackets will be available for our volunteers and must be worn by all coaches and on ice helpers. These can be picked up at the attendance table located in the arena lobby. We ask that you return the jackets on a hanger at the end of your ice time. If you would like to wear your own jacket it must be BLACK and must not have any other league or hockey school logos. Black track pants or warm up pants ONLY! No blue jeans, shorts or khakis on the ice or the bench! ABSOLUTELY NO SHOOTING PUCKS! Our players are very young and could easily get hurt by an adult's shot. Remember our mission statement: Fun, Participation and Development! Please remember that parents who have not registered as an on-ice helper or coach are not allowed on the ice for any reason! These rules are in place for safety reasons. 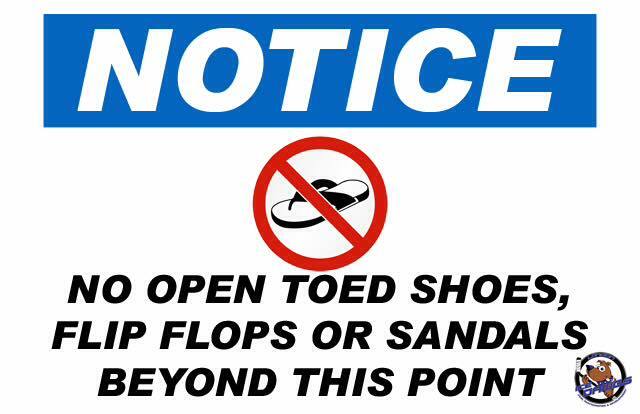 No flip-flops or open shoes at the arena! This includes all Ice Dawg coaches, volunteers, players, parents, siblings or fans! You will not be permitted in the dressing room area or the rink! No cell phones or cameras in the dressing room! No strollers downstairs in the dressing room area! If you need assistance please see the attendance table. Only 1 parent or guardian per player is allowed in the dressing room or the downstairs dressing room area. No siblings, or fans allowed! DO NOT open the rink gate for any reason! Ask a coach or volunteer for assistance! Please ensure that lollipop sticks/wrappers, hockey tape and other waste is placed in the garbage. We have our own Ice Dawgs lost and found at the attendance table. If you find something left in the dressing room or restaurant please bring it to the attendance table! Please DO NOT give anything to the rink staff!